The Smithville Area Chamber of Commerce presents the 24th Annual Festival of Lights Celebration on Saturday, Dec. 6th in downtown Smithville. 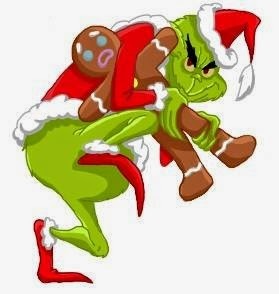 This year’s theme is “How the Grinch Stole Smitty,” and downtown Smithville is all dressed up like Whoville! 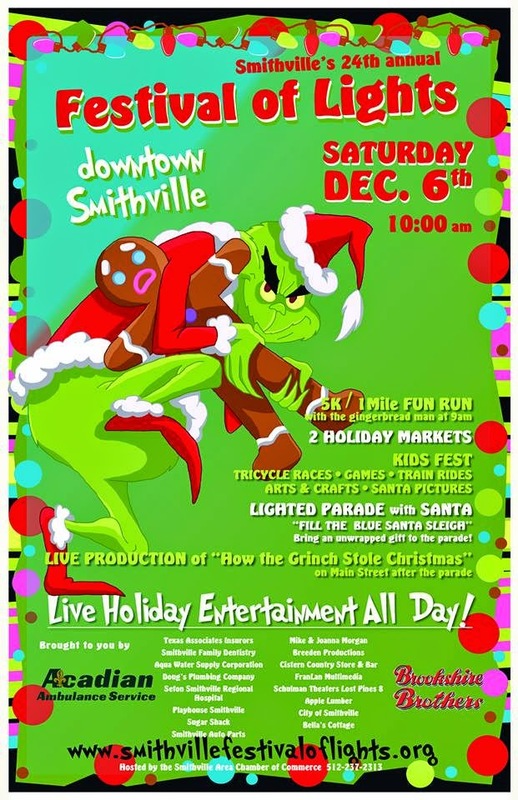 You can see the winners of the "Turn Smithville into Whoville" contest here. 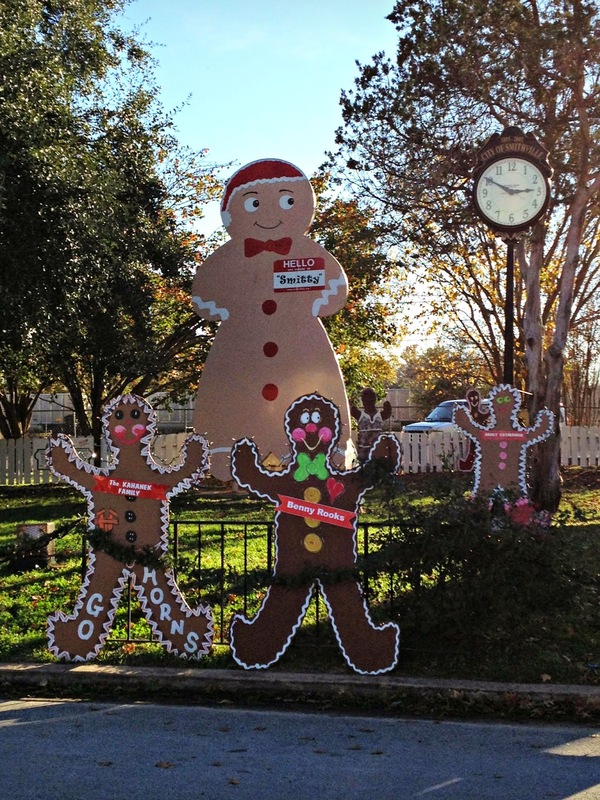 ﻿In case you didn't know, Smitty is Smithville's famous gingerbread man mascot. They currently hold the Guinness World Record for baking the largest edible gingerbread man cookie at 20 feet. The life-size monument can be found in Railroad Park at the intersection of First & Main Streets in downtown Smithville. The day begins bright and early with the 10th Annual Gingerbread Man 5K/1-mile Fun Run/Walk at 9am. Then, there will be plenty of shopping opportunities with a Holiday Open House at Patricia Wolf Designs, located at 314 Main Street from 9am-5pm, an Indoor Holiday Market at the Smithville Recreation Center from 10am-5pm, an Outdoor Market on Main Street from 10am-5pm, and lots of sales at the downtown shops. In addition to shopping and fun stuff for the kids, there will also be lots of delicious food, live music and entertainment (see schedule below), and train rides on the Ann Powell Express Train. The annual lighted parade starts at dusk, and there will be a FREE live performance of "How the Grinch Stole Christmas" after the parade at Playhouse Smithville. 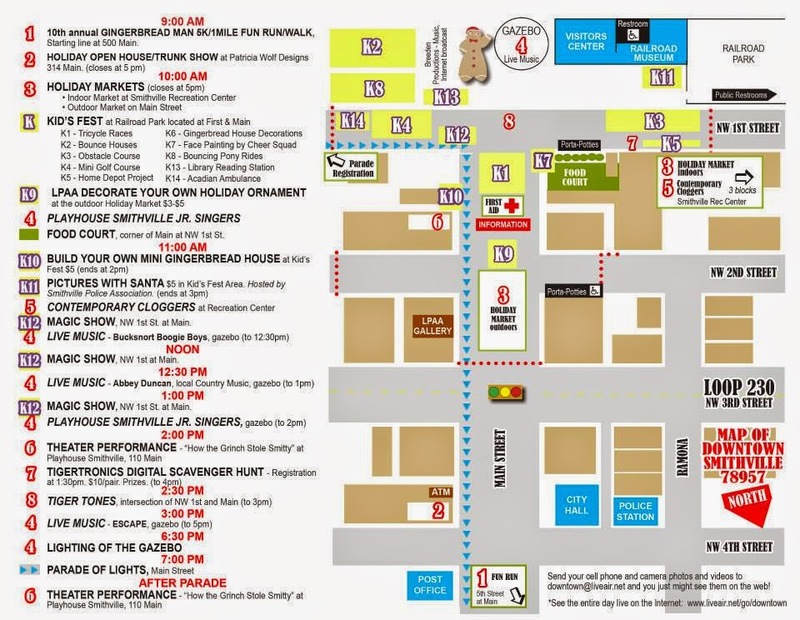 2:00pm - Playhouse Smithville presents "How the Grinch Stole Christmas"
8:00pm - Playhouse Smithville presents "How the Grinch Stole Christmas"
For more information about the Festival of Lights, click here.